Where is it ? About seventy-five kilometres west of Faro airport. About one hour transit by car. How big is it ? The town of Alvor has a permanent population of about 7000. 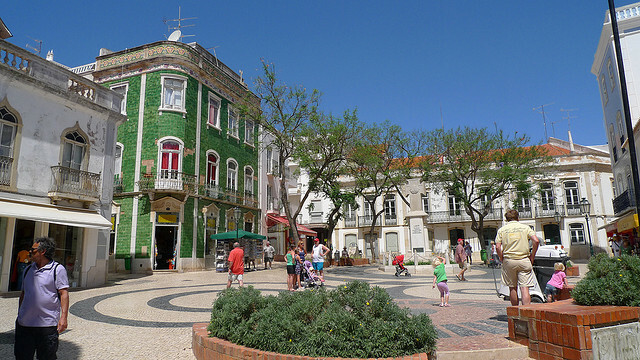 However the region around Alvor, Portimao and Ferragudo attract a lot of tourists so expect some hustle and bustle, particularly in the summer months. Who goes there ? Alvor is popular with families nearly all year round. What about Food and accommodation: Alvor is centrally located near Portimao and Quinta da Rocha So there are lots of restaurants and hotels. There is a regular bus route from Alvor to Portimao. Alvor started out as a small fishing village but since the nineteen sixties it has grown outwards. Located about five kilometres to the west of. During the Moorish occupation it even had a castle which unfortunately, like almost the rest of the village, was destroyed in the 1755 earthquake. The village is located facing a natural lagoon onto the ocean. The narrow streets in the centre offer a surplus of nice shops, restaurants and cosy bars.The main touristic area in Alvor is the Rua Dr Alfonso Costa. from here you can walk up a small hill to the towns thirteenth century castle which is also home to a market and children’s play areas. About a kilometre away is the Alvor Praia one of the cleanest sandy beaches of the Algarve. The village passed through Portuguese and Moorish hands several times until 1250 when the Christians conquered it for the final time. King Dom Joao II, who is regarded in history as an outstanding Portuguese king made the town briefly famous by dying there after a long illness in 1495. Although Alvor maintains its charm, it is local to newer more upmarket areas such as Portimao and Lagos so is at the heart of a touristic hub. Holiday makers seeking some Algarve golf have a choice of several championship courses to choose from.